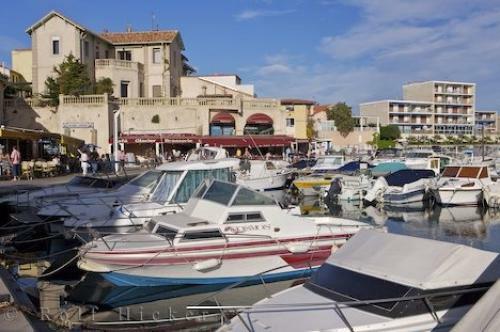 The waterfront and marina in the village of Sausset Les Pins in France is surrounded by great restaurants. Marina in the village of Sausset Les Pins, Cote Bleue, Blue Coast, Provence, France, Europe. Photo of boats tied to the marina in the town of Sausset Les Pins, Provence, France.